A print friendly downloadable PDF. Dolomite pocket pulling, a wide variety of chill camping, beautiful scenery in an enormous canyon with mild weather nearly year round, seriously, what more could you ask for? Ten Sleep Canyon has slowly but surely crept its way onto most peoples 'climbing destination' radar over the past fifteen years as more and more crags and routes have been added each season. Do you like 5.10 & 5.11 moderates? Are you a 5.12 crusher? How about one of those mutant 5.13 and up climbers? 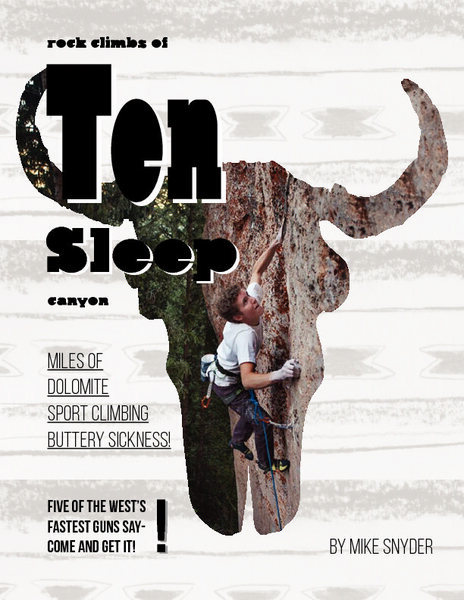 Ten Sleep has so many 5 star routes at every grade that everyone in the group will find their new favorite route at any of dozens of crags hidden/nestled in the forested canyon. With some very plush FS pay camp sites and free camping spread out at all elevations you are sure to find a perfect place to pitch the tent or chock the tires no matter what season you choose to visit. The welcoming little town of Ten Sleep offers several eateries and a gas station, there's even a brewery that has camping and showers. The larger towns of Buffalo and Worland lie in either direction about 45 minutes away from the climbing when its time to restock rations. The Rakkup Ten Sleep Rock Climbing guidebook has an initial offering of some of the most popular areas along with some new and completely unheard of gems (psst, Crag 6). Over 700 routes of what has been described as the 'buttery sickness' will get you started. Longtime local and route developer Mike Snyder plans to continue to add more and more satellite crags until the guide is complete. Accurate trail maps, crag and route descriptions along with photos of each route and all the details will help you plan your trip or day of climbing. Aaron Huey's informative and quirky guide to the area. A new edition was due out on June 16, 2006. Worth getting, since the 2005 edition does not include many of the newer routes. The 2005 edition has maps, photos with route overlays, written route descriptions, a list of routes by difficulty, but no index. Some areas are not covered by request of the first ascensionists who are still putting up new routes; maybe these will be covered in the new edition. Email argonautphoto@yahoo.com or call 206-909-4727 to order the new fourth edition (includes intro by Stan Price and 150+ climbs in the lower canyon). Download the Cody Rock Climbing Guide from Rakkup.com for your phone or other mobile device. Including over 400 roped routes on Dolomite and Granite through out the beautiful Shoshone Canyon. Updated regularly, this is the most comprehensive guide available with color photographs and topo lines for every climb, GPS navigation, detailed descriptions of crags, trails and climbs. Cody is already known as one of the best ice climbing venues in the country and for the sandstone boulderer the density and quantity of problems is unparalleled in Wyoming. What you may not know is that Cody also hosts outstanding granite and dolomite rope climbing as well. 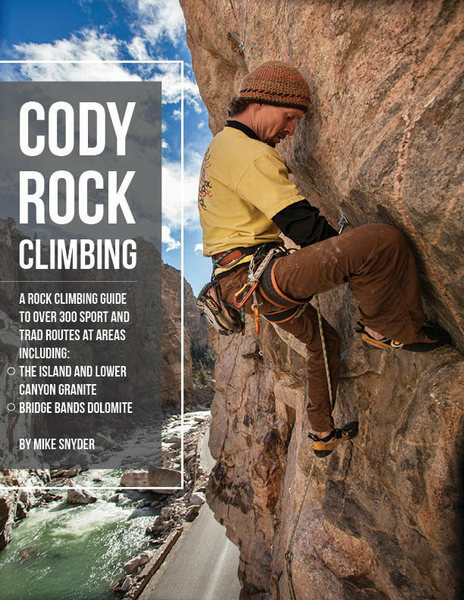 Cody Rock Climbing guide features 400+ routes of single pitch and mulitpitch sport and trad. Codys granite climbing has exploded in the last 10 years. The local favorite crag, The Island has many well protected granite sport routes of impeccable quality with grades ranging from beginner to 5.13a. The awe inspiring and massive river cut gorge of The Lower Canyon Granite has amazing climbing. There are incredibly only 200 routes here with new routes going in constantly. Everything from easy to protect splitters, to multi-pitch sport and trad routes, to modern sport cragging exist with a beautiful river and a closed to vehicle traffic, paved road for easy access. 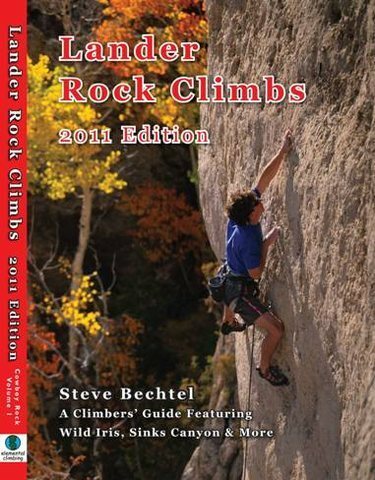 This 2011 edition (re-titled "Lander Rock Climbs" due to the inclusion of several trad areas) features a whopping 250+ new routes and eleven new crags, bringing the updated route total to over a thousand excellent lines. The book is the most current guide to Todd Skinner's legenday stomping grounds of Wild Iris and Sinks Canyon, but also includes numerous lesser-know areas near Lander like Baldwin Creek and Fossil Hill. The guide has something for everyone with 112 5.13s and sixteen 5.14s (up to 5.14c) to keep the hardiest of hard men busy for years, and roughly 350 routes rated 5.10 and below to keep their entourage happy as well. The original guide was among the most visually striking and easy to use guides available in the country. The new guide is every bit as stunning and user-friendly with several key additions, including detailed area maps, inspiring climbing photography to get you psyched, and precise phto-topos of neary every inch of cliff (in particular, new topos of the Killer Cave, Moss Cave, Rodeo Wave and Rising From the Plains make it easy for the unitiated to make sense of these previously-confounding crags). Key additions to the new book include the exceedingly popular Sandstone Butress crag (featuring nearly 100 trad routes--single & multi-pitch included) in sinks canyon, the new granite crags at the top of the canyon, THE place to find shade in Sinks Canyon, and a previously undisclosed limestone crag near Wild Iris, the secret home to Lander's best 5.12a. And of course, all the sick new 5.14's BJ Tilden has put down in the last 5 years (meaning its no longer necessary to scour his 8a.nu score card for beta!). As for the original, this edition also includes comprehensive First Ascent information, an alphabetical route index, and a by-grade tick-list that will leave you overwhelmed and anxious to get strong! The compact format has been maintained, complete with rounded corners and sturdy construction that make it easy to shove in the top of your pack or even in the pocket of your Prana shorts. Each area overview includes detailed approach instructions, cliff orientation, and an exceedingly useful break-down of routes by grade. The introduction covers comprehensive beta for the city of Lander, easily the most climber-friendly town in the nation. This section includes brief descriptions for each of the best restaurants in town, tells you where to find other dirtbag necessities like free camping, internet access, the latest issue of Rock & Ice, a new pair of rock shoes, even a cheap shower (hint, hint). A section on maintaining access and how you can give back to the climbing community are there for good measure as well. As a lover of climbing history, I would love to see a chapter on Lander climbing history. However, realizing that an area as rich in legend as Lander would require a book in its own right, I can understand the desire to leave it for a separate volume. Fortunately for all of us, I hear Steve is working on one of those at this very moment. The guide is not in color, but this book is a great example of how black & white photos, when done right, can be every bit as informative as color (though not quite as fun to look at). Overall, this is an outstanding work and a must-have for climbers of all abilities. If you've never been to Lander, now is the time to book your trip and enjoy the best limestone in America (ya, ya, Dolomite; whatever). It won't be long before Steve, Bob, Tom & BJ have added another 100 high-quality routes to the area. Beta on where to eat, sleep, shower & train in Lander, WY. Devils Tower, the ultimate crack climbing destination, has never seen a book like this. Comprehensive coverage of all its classic free climbs is accompanied by full-page photos and the wildest stories you can imagine. This full color book includes photos of the cliffs, in-depth topos and verbal descriptions of each route. Loads of old school photographs and tales of the legendary ascents and pranks that went on here fill out the book's 220 pages. As an added bonus, four tear-out route cards are included so you can climb with all the information you need at a fraction of the weight. Gas up the car and grab a partner; it's time to road trip to the Tower! The definitive, local guide to the sport crags of Jackson Hole. Includes Rodeo Wall, Blacktail, Rock Springs, and Hoback Shield. Few other landscapes offer such a rich diversity of climbing, in beautiful surroundings, as do the Jackson and Pinedale areas. Jackson, at the base of the Teton Range, and Pinedale, at the base of the Wind River Range, are amongst Americas greatest mountain playgrounds  worthy of any climbers tick list. This is your guide to over 400 climbs ranging from 10-foot boulder problems to thrilling 600-foot free climbs. Includes bouldering, top roping, sport, traditional, and ice routes. The complete guide to climbing at Vedauwoo. Over 500 routes covered. Black-and-white photos and diagrams; excellent photographs, diagrams, and diagrams over photos; epic tales, new areas, aid routes and first ascents. Fits in the top of your pack. Color route and action photos, maps. This is the current guidebook for Vedauwoo Wyoming. This book sets the standard for user friendliness with enhanced digital imagery to show where the routes really are, and there are 475 routes from 5.2 to 5.13. For beginners to experts with a variety of climbing from slabs to chimneys. Full index and tick list.